Memorial Day provides a wonderful opportunity to honor those who have died in the service of our country. Originating at the time of the American Civil War, Memorial Day has been extended to encompass all Americans from all battles who have perished while serving in the military. There are so many attributions to the founding of this day, I’m not sure we’ll ever really know whom to thank. From the women who decorated soldier’s graves in Savannah, GA in 1862 to the burial of the martyrs of the Race Course in Charleston, S.C., many people in many states felt a call to honor the fallen. 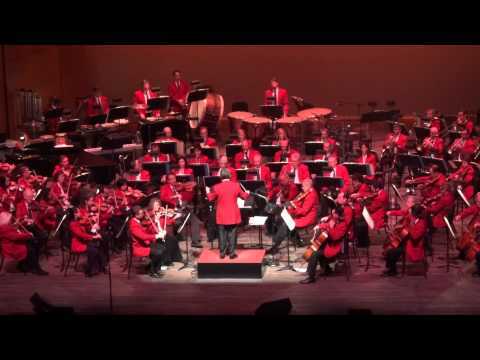 In 1868 General John A. Logan issued a proclamation calling for “Decoration Day” (i.e. decorating the graves with flowers) to be observed nationwide on May 30th. Today, on the Thursday before Memorial Day, 1,200 soldiers of the 3rd U.S. Infantry place small American flags at each of the 260,000+ graves at Arlington National Cemetery. They patrol 24 hrs. a day throughout the weekend to ensure each flag remains standing. Dozens of ceremonies like this happen nationwide, too numerous to mention. 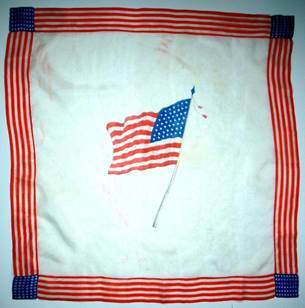 A Handkerchief was perhaps the one thing portable enough for a soldier to carry into battle, close to his heart to remind him of his loved ones back home. Rain, snow, and sleet might disintegrate an oft-read letter, whereas a handkerchief, delicate as it might seem, was strong enough to withstand the rigors of battle, and many survived, providing much needed comfort in times of solitude. 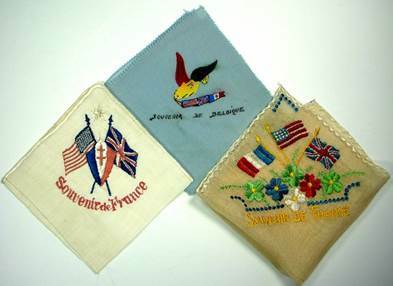 (thus their well-deserved appellation Handkerchief Heroes) These silk hand embroidered beauties are from WWI. 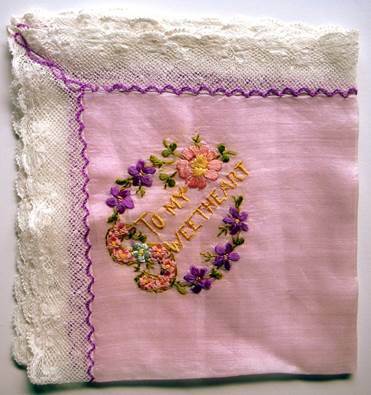 Many soldiers brought back souvenir handkerchiefs from the war to their sweethearts. 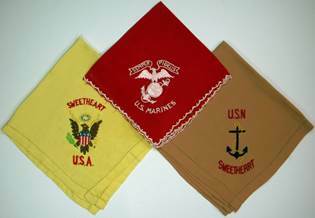 By WWII, many handkerchiefs were made from more durable nylon or other synthetic fabrics. Remember these were keepsakes, not utilitarian. 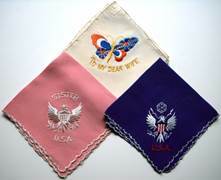 The ones on the left pay homage to a soldier’s mother; (your saw them in our Mother’s Day blog) the hankies on the right are gifts for a sweetheart. 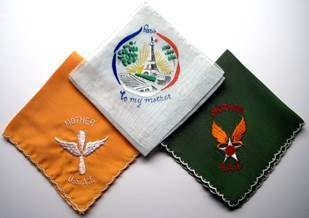 The hankies below honor sisters and spouses. Note the cleverly stylized British flag in the butterfly’s wings. Also note the bird in the pale blue hankie from Belgium carries a banner with flags of the Allies. Aren’t these terrific? 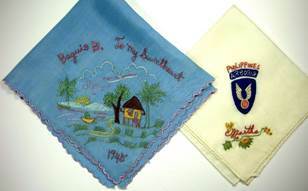 Adding a bit of levity is this hand painted souvenir hankie a young man might have gifted his wife or mother to thank her for the countless hours of washing and ironing performed on his behalf he was oblivious to, until having to undertake the task himself. To add insult to injury, apparently the dog has no appreciation for his efforts as well. 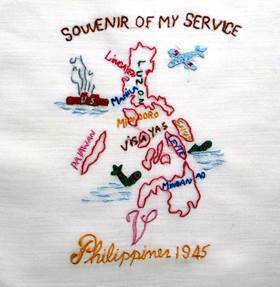 Goodness… once again life trumps art…..
Moving on to our troops in the Pacific, we find a plethora of intricately embroidered souvenirs – the cotton hankie on the right even shows planes crashing into the sea. Although beautiful specimens of handwork, writing about them brings a wave of sadness. I once visited Manila, and my most vivid memory from seeing the war memorial was observing how the fallen were buried. There was no distinction when it came to nationality. All the graves were mixed together, with US soldiers buried shoulder to shoulder alongside Filipino soldiers, just as they were when they fought in battle. 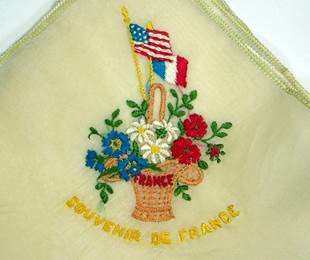 On the left, two very different styles of souvenir hankie laid one on top of the other. 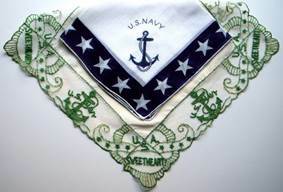 The navy and white hankie sports a patriotic border of stars, while the silk fashion hankie is adorned with elaborately embroidered anchors. Meant strictly for show, a gal might drape this over her belt or let it peek from a breast pocket to let all know her man was in the navy. 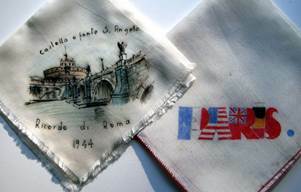 The souvenir handkerchiefs on the right are hand painted silk, with the Parisian one cleverly sporting the flags of the allies. 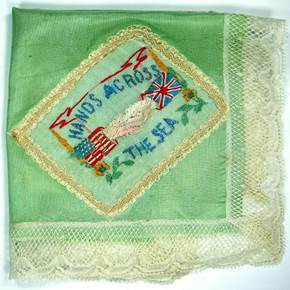 This silk souvenir handkerchief from Cunard’s R. M. S. Aquitania (1914-1950) may be from her early years before the war. With a shortage of ships, passenger lines were conscripted into service. Aquitania’s glamorous visage was camouflaged in battleship grey when she served as a trooper and hospital ship during WWI, and troop transport in WWII. In her 8 years of military service the Aquitania carried more than 400,000 soldiers. 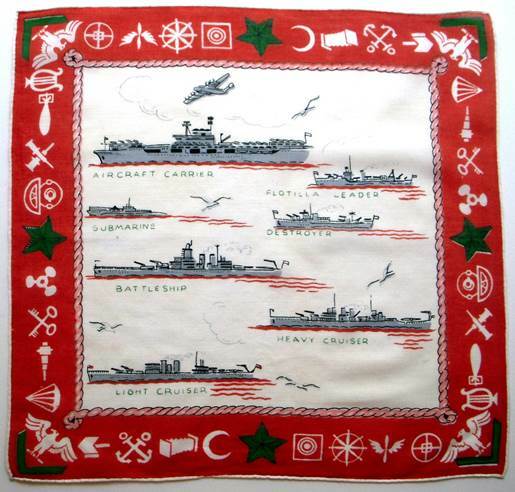 Here’s a hankie to help you identify ships as they came into port. Can you identify the logos and symbols adorning the colorful red border? 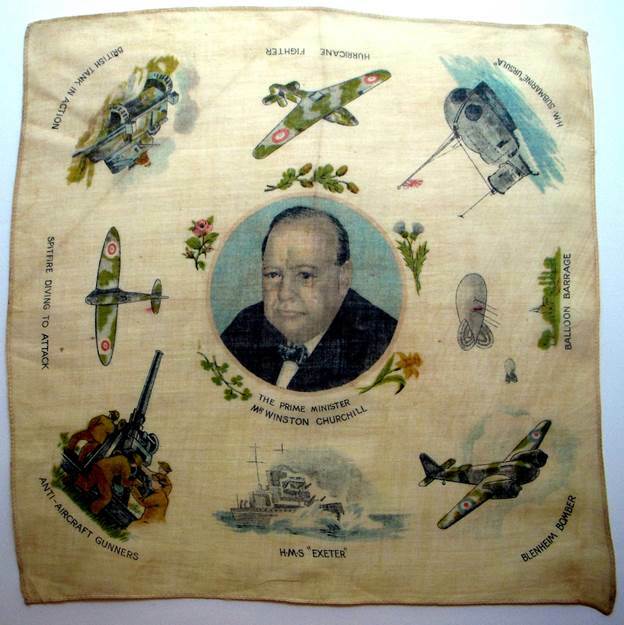 A British remembrance hankie features Winston Churchill surrounded by branches of the military. Featured are the dynamic Spitfire, whose brave pilots earned laurels for their valor in the Battle of Britain, the H.M. S. Exeter, sunk at the Battle of the Java Sea in 1942 (which helps us date this handkerchief) and the H.M. Submarine Ursula, transferred to the Soviet navy in 1944. While visiting London in 1989, I had the opportunity to view an exhibit of Scarves through History at the department store Harvey Nichols. What began as a colorul feast for the eye, suddenly took a bone chilling turn. In one room, hanging from guy wires like tiny parachute jumpers, were antique silk scarves worn by WWII airmen. They were so cleverly displayed, I didn’t realize at first they were more than scarves. 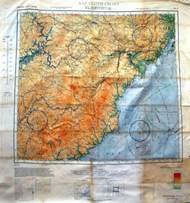 Printed on the delicate silk were topographical maps of the territories into which the parachute jumpers were dropped. If caught behind enemy lines, a simple scarf could be a lifeline to freedom. These were not the colorful maps we navigate from today. These little lifesavers contained sketchy outlines of rivers, mountain ranges and roads, but were drawn in such a way that no one would ever suspect the wearer was sporting a survival map. Suspended in the spotlights like ghosts from the past, you could almost sense the courage, fear, resolve, and resiliency their owners experienced when outfitting for a mission. 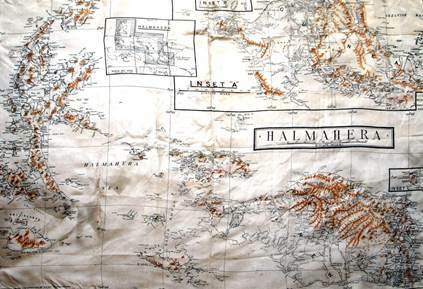 I have since come to own at least one silk survival map, gossamer thin and delicate as a butterfly wing – of Halmahera, an island in Indonesia, site of a Japanese naval base at Kao Bay. 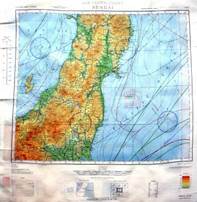 I also have maps of Sendai, eastern Asia and Okinawa. I would love to have some of the European theater, but they are far outside my budget, I’m afraid. The maps for airmen and seamen were made from nylon and (I’ve been told) coated with pectin or other substances to make them waterproof and fairly indestructible. Indeed, they are still in fairly good shape 70 years later. This survival map depicting islands and currents in the pacific was printed by the NACI in Washington, D.C. When I looked up National Agency Check with Inquiries, (still used today for security clearance), it said NACI was part of Presidential Order 10/04/50 signed by President Dwight Eisenhower in 1953. So, perhaps this was used during the Korean War. Necessity is indeed the mother of invention and these maps/scarves/handkerchiefs are most ingenious, don’t you think? 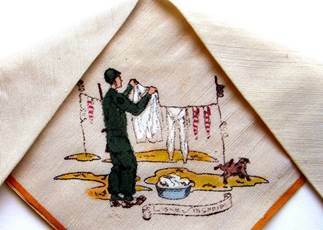 More than 20 years after I first viewed the airman’s scarves, someone shared a story about another fascinating use of silk handkerchiefs employed by WWII POWs. You can find a detailed account in The Game Makers, a 2004 history of Parker Brothers. British game maker Waddington PLC, held the U.K. license for the popular American board game Monopoly. 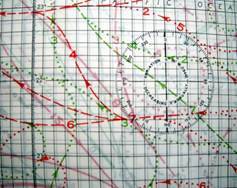 Because of their printing expertise, the British War Office enlisted their services to print survivor maps for POWs, like one of those you’ve seen above. 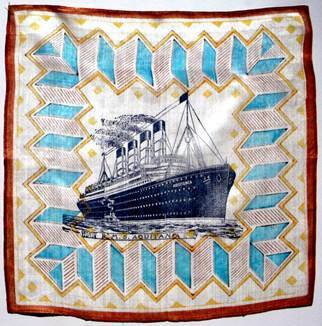 They were printed on silk so fine it could be hidden in Monopoly game pieces (as well as a pack of cigarettes). Clever Waddington personnel also added a playing token containing a small magnetic compass, a two-part metal file that could be screwed together, and purportedly, genuine German, Italian and French currency hidden within the play money. Both British and American air crews were advised on how to identify “rigged” games. A tiny red dot, made to look like a printing glitch was located in a certain corner. Supposedly the story wasn’t declassified until 2007, but the Associated Press reported the story back in 1985. With mass use of the internet, the story spread worldwide. It was also reported that the category “games and pastimes” allowed the boards to be inserted into CARE packages distributed by the Red Cross to POWs. But an archivist with John Waddington counters: “Waddington produced many escape aids which were sent to the Nazi prison camps, but these were always sent via private, often fictitious organizations like the Licenses Victuallers Prisoner Relief Fund. No escape aids were enclosed in the Red Cross parcels, so that the Germans would have no justification for stopping these much needed parcels from reaching prisoners.” By whatever means these games reached the POWs, the maps and tokens assisted captives in their race to freedom. This Memorial Day, let us take a moment to thank the men and women who guard and protect us daily, and all who have gone before them who gave their lives to protect our freedom. This one may take your breath away. 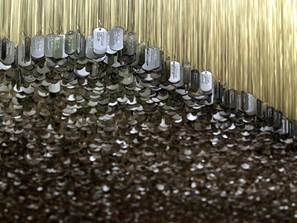 It’s from the National Veteran’s Art Museum in Chicago. At first it appears to be an ultra-modern light sculpture. 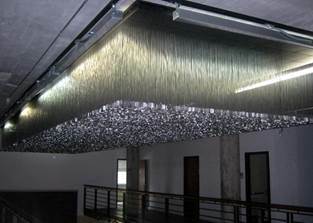 Upon closer inspection, you’ll see it’s composed of thousands of ID tags.